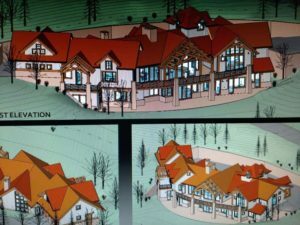 SNOWMASS VILLAGE RESIDENCE CONCEPT DRAWINGS……. This contemporary style, custom designed project is 6000 + square feet and includes high end finishes in all areas. There are six sleeping areas in all: Master bedroom, 3 exclusive suites and 2 associate bedrooms. There are private bathrooms for all sleeping areas, large kitchen with alcove, office, recreation room, 3 car garage and a large deck for outside entertaining. Shingle and rusty corrugated roofs, barn wood siding and Arkansas stone make up the exterior materials in a configuration that blends itself to the site.